"A delightful welcome party for a sparkly new work in Laufer and Green’s Window Treatment, a work which deserves to be seen far beyond this run." BOTTOM LINE: An evening of new one-act, one-actor musical works hits a home run with Window Treatment, a delicious piece about a woman lovingly stalking her neighbor. All three works light up with the abundant talents of the performers (one of whom is Broadway luminary Rebecca Luker), but only one story feels fully at home within these structural parameters. That one is Window Treatment, a firecracker of a musical from composer Daniel Green and librettist Deborah Zoe Laufer, which zooms into one pivotal evening in the life of a lonely doctor (the superb Farah Alvin). Our heroine has built her life around stalking the man who lives across the street in Apartment 7C (with her binoculars, she can even see through the window what brand of dill he’s dipping his crackers in), and, when we meet her, she’s in a panic because this man she’s never met has not arrived home at the usual time. Green and Laufer expertly fill out their half-hour with wide variation in music and characterization. What helps to keep things interesting is that their protagonist can turn on a dime from noisy hysteria to steely resolve to overdramatic desolation to anticipatory elation. (The simple orchestration also gets brilliant mileage out of the combo of piano and vibraphone.) Green’s score finds sizzling synergy with Laufer’s sharp text, sliding smoothly from an eccentric contemporary musical theatre sound into a bona fide habañera as the narrator recounts her near-misses at meeting the object of her affection in person. As crazy as this woman’s imaginings may be, Window Treatment takes full advantage of its monologue form—she might not actually choose to share these thoughts aloud with other people, so we’re just privileged to the endearingly zany collection of fantasies that fill up our heroine’s head when she’s home alone. 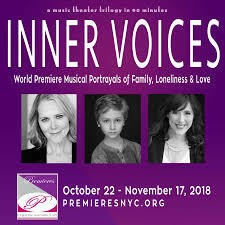 As a complete evening, Inner Voices provides a fascinating look at how very different stories can be told within the same constraints. It’s also a delightful welcome party for a sparkly new work in Laufer and Green’s Window Treatment, a work which deserves to be seen far beyond this run. Deborah Zoe Laufer’s hilarious script plumbs every scrap of comic potential lurking in the mind of a relatively benign stalker. Daniel Green’s music is packed with sly homages, from rippling Chopinesque arpeggios to castanet-clicking habaneras—there’s even a nod to Les Miz—and director Portia Krieger piles on the comic beats so deftly that we never pause to pity this obsessive oddball. Dr. Carson is a fighter: “If I were suffocating you, you would know it,” she says, using an imaginary pillow to reenact a prior breakup. One way or another, this kook will prevail. If you’ve never obsessed over a romantic crush, you’re probably lying. Deborah Zoe Laufer understands. Her 45-minute musical, Window Treatment fully captures the feeling of longing for someone you’ve only seen, but have never met. Daniel Green provides the music to Laufer’s tale which succintly captures every feeling of romantic attraction: lust, hope, worry, fear, jealousy, anger, betrayal, doubt, and insecurity. The first show of the evening, Window Treatment, was my favorite. Farah Alvin plays a kind of sweet stalker who is in love with a man who lives across the way. He doesn't have curtains, and she watches him, lovingly and creepily, with binoculars. She has also followed him in the real world, but has never spoken to him. Written by Deborah Zoe Laufer (words) and Daniel Green (music), the show is stuffed full of psychological insight and humor. Alvin's performance makes the most of her amazing voice, excellent acting, and heartfelt clowning. It's a real treat.